As seen on CBS Travel News, CNBC, Robb Report and so many more...You will learn and perform basic flight maneuvers including how to takeoff, cruise and land. On this 1 hour and 30 minute experience you will fly alongside the tallest sea cliffs on Earth, then your option to perform a takeoff and landing on Kalaupapa, Molokai. Upon landing you can switch pilots if your partner wishes to fly. Then on way back fly directly over portions of the coral reef of Molokai, Kapalua, West Maui and land back in Maui. A flight training certificate, signed by your instructor will be presented to you upon completion. 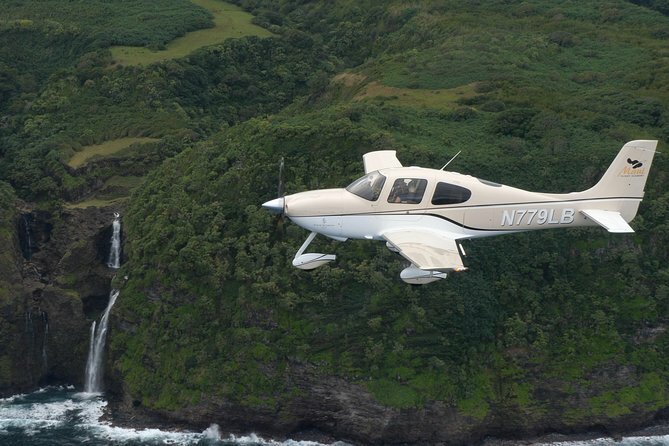 The Cirrus SR22 is a very easy airplane to fly. It has the most advanced safety features of any aircraft flying today, including a built in parachute system for the entire aircraft. Most bookings for Molokai are for 9am. Please contact us to verify your time. No experience is necessary, however we recommend you read our pilot study guide and watch our videos online. Maximum weight for any individual is 285 pounds, and the maximum for the group must not exceed 600 pounds. A go pro video will be made available for an additional fee. Gratuity for you instructor is greatly appreciated. General Aviation side of the airport. Past the heliport, near the air traffic control tower. Hotel pickup and drop-off is not included. Please park next to gate 5.2, at the END OF THE FENCE, you will see 2 RED signs for Maui Flight Academy customers only.